The BOSS system is not a typical 1-2-3 system, it is a much more flexible concept. This allows you to find the perfect combination of creams & pads to address any specific polishing condition you come across. got to correct it. Best yet, these pads and creams are color coded. With 4 liquids, 5 pad types (and the Innerflex cushioning pad) in two sizes, you have hundreds of unique polishing combinations. 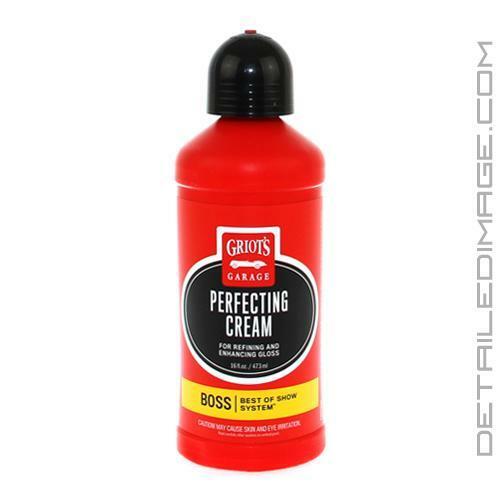 If you are looking to remove light imperfections while finishing down great, do not hesitate to try the Griot's Garage BOSS Perfecting Cream! Perfecting Cream is an excellent finishing polish and has worked flawlessly on every paint type I've worked on so far, even those soft, touchy black B-pillars. Paired with the yellow pad it completes my go-to 2-step combination and I've been thrilled with its overall performance. Formulated with a balanced blend of sub-micron abrasives and polishing oils, that add amazing gloss and depth of color, BOSS Perfecting Cream finesses the finish by removing the most minute swirl marks and hazing holograms. I detail full time so I'm always trying different compounds and polishes looking for the best product that both works and is easy to remove. I tried the BOSS line about 2 years ago and haven't looked back. Granted I do try other products from time to time, but BOSS Perfecting and Fast Correction Cream still remain my go to products. Long working time, finishes down perfect on most cars, NO dusting, and easy wipe off. What more could a detailer ask for? I've only had 2 vehicles out of maybe 50 this year that I couldn't use perfection cream on. They had super soft paints and I had to take out m205 to get a perfect finish. Otherwise, 95% of the time Fast Correction and Perfection cream always get the job done! this is our GO TO product for heavy defect removal. good working time, great results!! After using the correcting cream followed up with this and left a deep color while leaving protection as well.